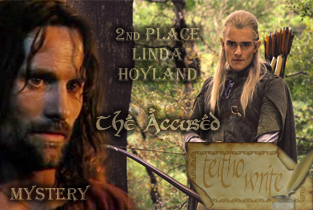 Summary: Aragorn and Halbarad are accused of a crime. Purpose: Written for the Teitho challenge April 2014: Mystery where it was placed 2nd. Dedicated to Nath as a belated birthday gift. Halbarad shook his head glumly as he joined Aragorn outside the Prancing Pony. "Not so much a scrawny rabbit to show for a morning's hunting," he sighed. "And here was I hoping for a good dinner," said Aragorn. "It seems we shall have to go hungry until we return to camp." "I am sorry," said Halbarad. "I doubt I would have met with any better success," said Aragorn. "Game is sparse at this time of year." "Now we face a five league walk with empty bellies," said Halbarad. "Have we enough coin for a bite to eat at the Pony first?" The two Rangers turned out their pockets but found only a few meagre coppers. "Only sufficient for half a mug of ale each," said Aragorn. "Still that is better than nothing. We could ask old Butterbur if we could clean out his stables in exchange for a meal. We must bring some skins and wool to trade next time we are in town to replenish our supply of coin." Halbarad sighed again even more deeply. "When I think of who you were born to be and that we are reduced to sweeping out stables to earn a few coppers, I could weep," he said. Aragorn clapped him on the back. "There are worse ways to earn an honest coin, cousin," he said. The two Rangers made their way inside the inn. There were few customers at this time of day and they were able to choose a table in a secluded corner near the fire. When Butterbur came to take their meagre order, Aragorn enquired if he required his stables cleaning out." "Nob swept them out this morning," Butterbur replied. "Trade is slow at the moment so he had time on his hands. Now will you be wanting anything else?" Aragorn and Halbarad sadly shook their heads. Butterbur disappeared into the kitchen at the back and returned a moment later with a loaf, which he placed on the table. "This bread is stale," he said. "You can have it if you want. There aren't enough folk around to warrant making bread and butter pudding with it. I've just had a thought now, if you two be wanting work. Ned Goatleaf, who fixes things round here, is laid up with a broken leg and Widow Woodsorrel across the lane is wanting someone to repair her roof. Her husband left her well off, and she would pay handsomely for anyone who'll do the job good and proper." He bustled away to serve another customer who had just entered. Aragorn and Halbarad divided the loaf between them. It was not very stale. Washed down with the ale, it somewhat assuaged their hunger pangs. They then went in search of Widow Woodsorrel. It took only a moment to find her as she was outside, scolding a man who hovered near her threshold. A part grown cat, its coat glossy black, apart from its white paws and whiskers, sat beside her on the doorstep, daintily washing its whiskers. "Be off with you, Bill Ferny!" she cried. "I'm not having you near my roof again. The last time you said you'd mended it, twice as much water came in as before!" "You'll be sorry!" cried Bill Ferny. "When the water's up to your knees and your roof falls down on you you'll wish you'd not sent me packing. Tell you what; I'll give you a good price if…"
The cat hissed then resumed its ablutions. "I think the lady has made her wishes clear," said Aragorn, interposing himself between the widow and Ferny. Ferny glared at him then slunk away towards the inn. "And who might you be?" asked Widow Woodsorrel. "I am called Strider and this is my kinsman, Halbarad," said Aragorn. "Master Butterbur told us you had need of someone skilled to mend your roof. We would be happy to repair it for you." Widow Woodsorrel eyed the Rangers suspiciously, while the cat started to groom its paws. "And how much might you be asking?" she demanded. "Whatever you think our labour is worth," Aragorn replied. Widow Woodsorrel snorted. "If you do a good job, I'll make it worth your while," she said. "If not, you get nothing. Agreed?" "Agreed," said Aragorn. "Now if you will show us where the leak in the roof is." Aragorn and Halbarad spent several hours repairing the hole in the widow's roof. They also looked round for any other repairs that needed doing. They patched up some cracks in the walls and mended a hole in the fence. Widow Woodsorrel and her cat watched them suspiciously. "I'm not paying you to rebuild the place!" she said. "I am simply doing some odd jobs as I would at my mother's cottage," said Aragorn. "It is not easy for a woman on her own." Widow Woodsorrel carefully inspected the repairs. Aragorn and Halbarad held their breath, wondering whether they would finally get to fill their rumbling stomachs or not. "Well, you've not made a bad job of it at all," said Widow Woodsorrel. "I see you've used plenty of pitch like my husband, may he rest in peace, would have done. " She reached for a bulging purse, which she wore attached to her waist. "Here you are." She rummaged in the purse, took out four silver pennies, and handed two to Aragorn and two to Halbarad. The Rangers regarded them in amazement. "What are you gawping at?" she demanded. "We cannot take all this," Aragorn protested. "I told you I'd pay well for a good job and I keep my word," said Widow Woodsorrel. "Now off with you before I change my mind. I need to bring in my washing and Blackie will be wanting his saucer of cream." As if to emphasise her words, the cat stood on his hind legs and pawed at the doorknob. "Thank you, mistress," said Aragorn. Halbarad echoed his thanks and the two Rangers hurried off before she could change her mind. "Four silver pennies!" Halbarad exclaimed. "That is enough to buy a pony!" "We have no need for a pony!" said Aragorn. "We do need supplies to see the women and children through the winter, though." "We should come back on market day with the horses," said Halbarad. "We can even afford a few trinkets for our loved ones." "But first let us have a bath, a good meal and a room for the night," said Aragorn. "For once we shall live like lords!" Butterbur showed Aragorn and Halbarad upstairs to their room. "The bed will sleep four easily," he said. "I reckon you'll be having it to yourselves though. Folk don't want to share with strange wandering folk, lest they be murdered in their beds. I'll be sending Nob up with the water for your bath." Aragorn and Halbarad tossed one of the silver pennies for who should have the use of the hipbath first. Aragorn won. While his kinsman was bathing, Halbarad stretched out on the roomy bed. "I could become accustomed to this," he said. "Fortune has smiled upon us today," said Aragorn from behind the screen that concealed the hipbath. A cloud of steam rose towards the ceiling. "Ah the bliss of a good soak, even if the bath is rather cramped." "Save some hot water for me!" laughed Halbarad. "We can wash our linens and stockings after we have bathed," said Aragorn. "Then enjoy a large plate of mutton roast, followed by apple crumble. My mouth is watering at the very thought!" Within the hour, two freshly scrubbed Rangers wearing clean linens entered Butterbur's common room. Now it was getting late, more customers had drifted in. Bill Ferny was sitting by the bar. He glared at Aragorn and Halbarad then returned to his drink. A group of Hobbits sat at a table near the door devouring what looked like a meal meant for Men double their size, while several Breelanders, who appeared to be farmers, sat together in a corner talking and drinking. Aragorn and Halbarad were just about to order their meal when Widow Woodsorrel stormed into the inn. She looked distraught. "My purse has been stolen!" she cried. Bill Ferny leapt to his feet and pointed at Aragorn and Halbarad. "It was them Rangers!" he cried. "Get them! They should be put in the stocks for robbing a poor widow woman!" "Shame on you!" cried the farmers. The farmers, together with a group of rough looking men who had been drinking at the bar, got to their feet and advanced threateningly towards the Rangers. Two burly men raised their fists, but they did not appear to be armed. Bill Ferny hovered at the fringes of the group and brandished a knife. Only the Hobbits ignored the commotion and continued their meal. "What's all this now?" asked Butterbur, emerging from the back room, followed by Nob. Aragorn and Halbarad leapt to their feet, their hands reaching for their swords. They would rather not harm the Bree- folk, but neither did they intend to be punished for a crime they had not committed. At the sight of the weapons, the Breelanders took a step backwards. "We are innocent of this crime," said Aragorn in a commanding tone." "My purse is gone and you were the last folk to set foot on my property," said Widow Woodsorrel from the doorway. "I should never have trusted the likes of Rangers!" "I saw you replace your purse on your girdle, mistress, after you paid us," said Aragorn. "But who else could have taken it?" demanded Widow Woodsorrel. "Apart from Bill Ferny, no one else has been near my cottage in days." All eyes turned to Bill Ferny. "Don't be looking at me like that!" he snarled. "I came straight here to the Pony and have been here all afternoon." "That he has," said Butterbur in a somewhat regretful tone. "The only strangers to come in are the two Rangers. I always took them to be queer folk, wandering as they do, but believed them to be honest enough since they always paid for their drinks." "Duck them in the village pond!" cried Ferny. Aragorn and Halbarad ignored him and Aragorn turned to address Widow Woodsorrel. "How was your purse secured, mistress?" he asked. "With a leather thong to my girdle," she replied. "See the leather is snapped here, where the thief has snatched it. The thieves must have known that this morning I received the rents on lands my husband left to me." "We know nothing of your affairs, mistress," said Halbarad. "We are skilled in tracking," said Aragorn. "If you would permit us to examine your garden for tracks, maybe we can solve this mystery for you and prove our innocence." "They'll make off the moment they leave here!" said Ferny. "I think not," said Halbarad. "My best shirt is drying in the room we have taken here." "Let someone come with us if you do not trust us," said Aragorn. "I'll go along with them," said one of the farmers. "I will too," said Butterbur. "Nob, watch the bar, until I get back." "Now tell me exactly what you did after we left, mistress," said Aragorn as the group made their way towards Widow Woodsorell's cottage. "I went round the back to bring in the washing," she replied. "Some of it wasn't dry, though, and some will need to be washed again. Blackie jumped up against it and covered it with muddy paw prints. After I'd scolded Blackie, I went inside to get him his saucer of cream and then I made a drink and cut some bread and butter for my tea, and ate it. It was while I was washing up the cup and plate I noticed that my purse was missing. I searched the house, but it was obvious it had been stolen, snatched from my belt while I was distracted!" Aragorn and Halbarad examined the tracks leading up to the front of the house. Their large boots were clearly visible, as were Ferny's and the Widow's smaller ones. It was clear that no one else had recently approached the cottage. "I should like to go round the back now, mistress," said Aragorn. "No one can get round there, the garden is surrounded by a thick hawthorn hedge," the widow protested. "Nevertheless, I should like to see the garden," said Aragorn in a tone most often used to command his men. "My washing is still out there." "I wish to look at the ground, not your laundry." Widow Woodsorrel looked about to protest further but thought better of it. She led the way to a spacious back garden with neatly scythed grass surrounded by shrubs and a thick hedge. In the middle of the lawn stood a washing line draped with sheets and voluminous undergarments. Blackie was sitting on the windowsill. He regarded the intruders with unblinking green eyes. Aragorn dropped to his knees and studied the ground intently for tracks. It was starting to get dark, but his keen eyesight detected where feet had trodden. Suddenly a gleam of silver amongst the shrubs caught his eye. He reached out and picked up a silver penny, which he handed to Widow Woodsorrel. "One of your lost coins, mistress," he said. "The thief must have dropped it as they fled," said the farmer. "How might they do that without snapping a single twig on the hedge?" asked Halbarad. Aragorn continued to rummage amongst the shrubs and picked up two more silver coins. Finally, he dived under the hedge and emerged triumphantly clutching the still almost full purse, though the strings dangled open. "Your purse, I believe, Mistress Woodsorrel," said Aragorn presenting it to the widow with a slight bow. "Why should the thief bury it under my hedge?" Widow Woodsorrel looked bewildered. "Who stole it then?" demanded Butterbur. "Here is your thief!" said Aragorn. "Where?" asked the farmer. "He should be put in the stocks to pay for his crime." "I think not," said Aragorn. "The greatest punishment you could inflict upon him would be to withhold his saucer of cream!" He turned and gestured towards Blackie who immediately leapt from the windowsill and disappeared within doors. "However did you work that out?" asked Butterbur, scratching his head. "The only tracks I found were those of Mistress Woodsorrel and her cat," said Aragorn. "I surmise that Blackie thought the dangling purse was a toy and grabbed hold of it when he jumped up and left muddy paw prints on the washing. He is just a playful kitten who meant no harm. The thong was worn and would have easily snapped. Mistress Woodsorrel was distracted by the prospect of washing the sheet again. Blackie dragged his new plaything across the lawn and into the bushes but soon tired of it as it was too heavy to play with." "Well, I never, the naughty boy!" Widow Woodsorrel flushed and looked uncomfortable. "I am so sorry. I would never have guessed. Please take this with my apologies." She held out a handful of coins to Aragorn. "I desire no payment, mistress, only to clear my name," said Aragorn. "Please, I beg of you!" Widow Woodsorrel looked distressed. "Think of it as a reward. Have you not wives and children you could buy a treat for?" Halbarad and Aragorn looked at one another for a long moment. Finally, Aragorn said, "There are many of our women and children this would help through the winter. I will accept your coins for them. We shall bid you good evening, mistress and partake of our supper now that your mystery is solved." "Thank you again," said Widow Woodsorrel. "I was mistaken about you. You Rangers are decent folk after all." A/n. I now have the honour to be owned by a very lovable and lively kitten so am likely to write and post less frequently. Any cat lovers are welcome to meet my kitten on my LJ blog,http://lindahoyland.livejournal.com/.